Something personal: Well, I think I’m ALMOST at the forgiveness stage! What a great quote right? I feel like my entire “mommy-hood” has been riddled with guilt in some way, shape or form. The latest guilt is about Jake’s bed. We recently took the front off of his crib so he could get in and out. 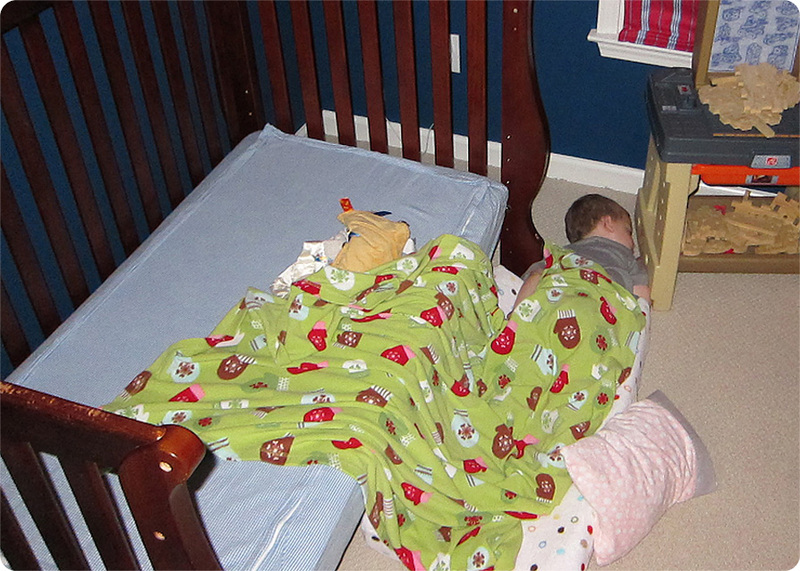 He has never climbed out of his crib, and in fact, I think he rather enjoyed the security of it. But now that he rarely takes a nap, I felt guilty (there’s that word again), that he had to pee in his pull-up when he’s perfectly capable of going to the bathroom on his own. Jeff and I have had many heated arguments discussions about the bed “situation” in our house. I feel like we should have gotten Kylie a full bed rather than a twin, since she has the larger room and will be more likely to have sleepovers, etc. That being said, I’m thinking we should get Kylie a full bed and move her twin bed into Jake’s room. Then we have the problem of how do we make her bed look more “boyish.” And then, we have to get some furniture for Jake’s room, namely a dresser. 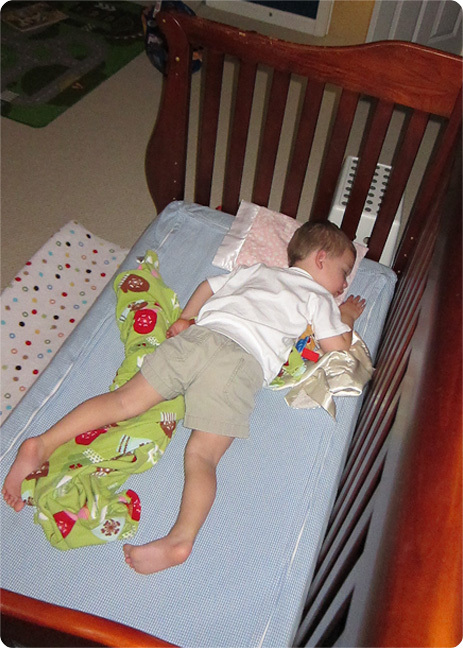 Rather than deal with all of these things, we decided to just take the front off of his crib (so it’s a toddler bed), and when I look at these pictures I’m feeling guilty (again) because he’s clearly too big for the bed. He falls off every night because he can’t even roll over without reaching the edge. This never would have been “good enough” the first time around, but for the second child, it’s just not that big of a deal right? *SIGH* I guess it’s time to do some furniture shopping. I thought I would share the snapshots. These were taken in VERY low light with my point & shoot camera. Hilarious right? Jake rolls off the bed, then continues sleeping on the pad we put next to the bed. I should add a footnote. 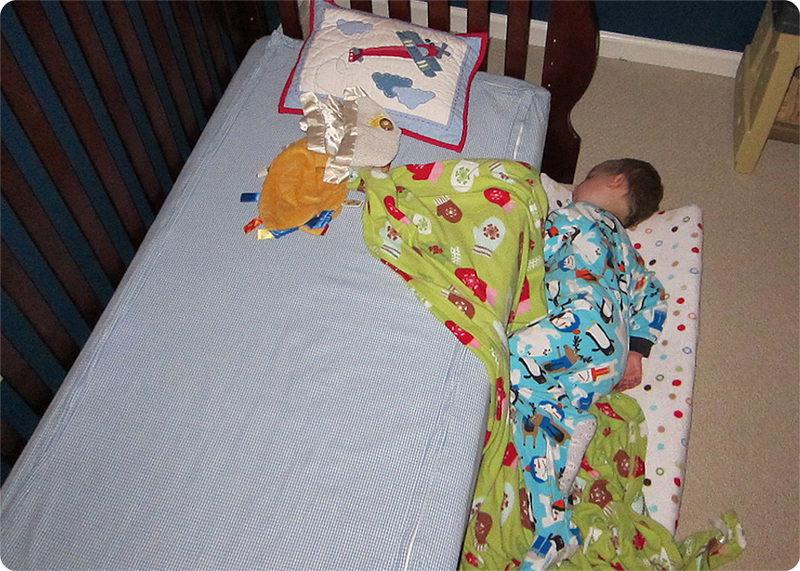 Jeff put the bed rail on at first, but I made him take it off since it’s not “supposed to” be used with cribs. My bad! Something I love: Mexican food!!! I love it!! At Chipotle, it’s the veggie bowl with peppers & onions. At La Paz, I love the Steak and Carmelized Onion Quesadilla. At Taqueria del Sol, I always get a fish taco and a chicken enchilada with lemon cream sauce. At Rosa Mexicano – GUACAMOLE!!! And now, thanks to my friend who had her 40th birthday last weekend, I found another restaurant with wonderful “upscale” mexican food — Alma Cocina! Okay, who’s hungry?? Heidi – Just my two cents since our kids are the same age: girls have sleepovers IN their beds while boys “camp out.” I would totally give the twin bed to Jake and buy Kylie the full size bed. My nephews “camp out” with their friends all the time while my girl prefers her girlfriends to sleep in her bed…..hence we have two full size beds in our house. Hope this helps!! !